GENERAL NEGLIGENCE - SLIP & FALLS - Jerry Martillotti & Associates, P.C. Trip/slip and fall accidents are usually no accidents at all. In most cases, they are simply the inevitable result of hazardous conditions that have been ignored or overlooked by a property owner, a business or its agents. Proving those conditions existed and that the owner knew about or should have known about the problem but did nothing to address it is the difficult part. Jerry Martillotti has been achieving outstanding results in tough-to-prove slip/trip and fall accident cases for over 17 years. Our success has been no accident. It has come as the result of honest hard work and determined advocacy, and has led to consistent referrals from our peers, medical professionals and others throughout the state of Florida. Careful investigation and detailed preparation are often the keys to success with slip and fall injury cases. We know local, state and federal building codes, and we have a strong understanding of foreseeable risks, hazards and safety procedures on business and residential properties. In addition, our attorneys work with engineering, safety and medical experts who testify on issues ranging from serious back injuries, the coefficient of friction for flooring, and on construction design including staircase design, proper lighting and railings - all in an effort to maximize your compensation and to get you the help you need when you need it most. 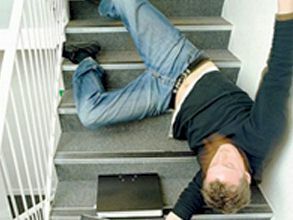 If you believe that you might have a slip and fall case, you should seek legal advice immediately. The initial consultation is always free and we can come and meet you at your home. We handle cases in Pennsylvania, New York, New Jersey, Maryland and the District of Columbia.